These questions go well beyond our treatment of other hominids, of course, and arise in considering everything from factory farming to the global trade in endangered species to the routine use of countless other species in medical and other testing. The film, not surprisingly, got a seal of approval from People for the Ethical Treatment of Animals, which also gave an award to the director, Rupert Wyatt, for insisting that no real apes be used during filming (something possible thanks to the geniuses assembled by Peter Jackson in New Zealand. I was heartened to see that the film did not completely tilt toward the predictable Hollywood approach to “Big Pharma” of an evil corporation plotting terrible things in the pursuit of money. While the new “Apes” film has the greedy head of a biotech firm only concerned about profits and dismissively referring to the company’s research chimps as property, its human star, Franco, represents something of a middle path. He plays a researcher who is willing to use apes as test subjects for drugs aimed at improving the human condition (including that of his father, fading from Alzheimer’s) — but who had an ethics-based line he wouldn’t cross. These are tough issues. I think the film will help nudge people to consider the potential ethical failures that underlie their health care. Another helpful prod was an Op-Ed article today by Representative Roscoe G. Bartlett, a Republican of Maryland, who makes a powerful argument for ending all laboratory work with chimpanzees. Only after their research was well under way did Jaffa have a “classic lightbulb moment,” Silver recalls, where he realized they had the seed of a fresh approach to the seemingly dormant “Planet of the Apes” franchise. We explored how the fast-forward pace of scientific knowledge and technical skill is seemingly outpacing humans’ capacity to comprehend and honestly grapple with the ethical issues that arise. 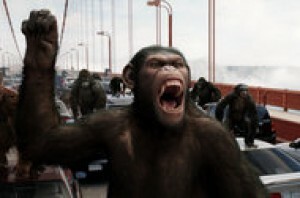 If you’ve seen “Rise of the Planet of the Apes,” what elements irked or pleased you? My view of life on Earth is that it’s a huge board game, and every species has but one goal: to take over the planet. And every species that could, would, if it got the chance. So we’re just doing what evolution has pounded into us: Produce as many of yourselves as you can. Make sure that, as you produce, you aren’t threatened in your production and co-opt all the planet’s resources. Kill any competitors, and spread to every place that you possibly can. We’re doing all of that. We get the prize, ironically, because of the brains that we have. Read the interview. While I liked the movie, I wasn’t thrilled with the notion that the chimps had to be genetically enhanced to be more “human”, cognitively, in order to be worthy of respect. That seems like the same ole same ole to me. Smarter does not equal deserving of greater moral status in the human world, why does it when we step outside our own species? With respect to Big Pharma and nuanced ideas of animal exploitation, I was glad that the Franco character was sympathetic, but don’t consider that an argument in favor of seeing exploitation as morally correct, or even as nuanced. It’s just good storytelling, and closer to the truth: people are complicated (human as well as nonhumans). As to Peter Ward’s quote: reductio ad absurdum. A strictly genetic viewpoint like that leaves too much out, justifies too much, and relieves humans of making the “difficult moral choices” you talk about. Why not look at individuals instead of genes in both humans and nonhumans? As Jonathan Balcombe (biologist/ethologist) puts it (paraphrased) — Nature may be cruel, individual animals usually aren’t. I don’t think the movie will change any status quo thinking. To you, that may be fine. To me, an abolitionist, it isn’t, really. But I liked it anyway. As I said, peeps are complicated. I enjoyed your blog post, but I am concerned about your statement that “certain research” requires the use of chimpanzees. That is no longer the case, according to everything I heard at last week’s meetings of the federal Committee on the Use of Chimpanzees in Biomedical and Behavioral Research. Biodefense experts destroyed the canard that chimpanzees will be needed to test against bioterrorism. Most importantly, I was pleased to learn, as I know you will be, that pharmaceutical companies no longer need to use chimpanzees for their research. Using chimpanzees in research is a matter of choice now, not necessity, with the wonderful scientific advancements of the last 10 years. Genentech and GlaxoSmithKline gave presentations explaining how they stopped using chimpanzees. They are now setting a powerful example for their more reticent colleagues in the industry.